This squirrel shirt is a tribute to the National Lampoon's Christmas Vacation movie. Available in red and green in men's sizes, you can buy this shirt here. The catchy phrase "Beware the Christmas Squirrel!" pretty much sums up what makes this shirt so great. The active silhouette of a squirrel leaping from the Christmas tree seals the deal. Available in festive colors of red and green, this makes a great holiday gift for the men you love. It also makes an appropriate holiday warning to those who use living trees to decorate their homes during the winter holidays. 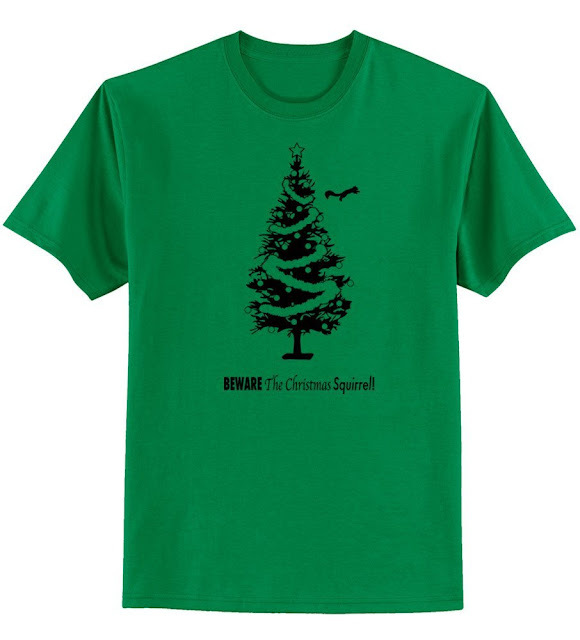 Check out the other Christmas Lampoon Squirrel Shirt here. For the real fans out there, here's a word of truth: A Christmas Vacation Attacking Squirrel with sensor and sound available in the gift shop (Misc. Section).